While the Canucks may have lost on that notorious night two months ago, it seems this city does have a champion who can overcome adversity. Chef Dale MacKay and crew aced the test of that accident, and have gone on to win over more patrons and critics. Ensemble is the most talked about restaurant in town, more so than Hawksworth, the new flagship establishment at the Rosewood Hotel Georgia. When I asked three foodies in the city which of the two I should try, since I only had time to visit one more spot on my stay, all three sided with Ensemble, citing its originality. MacKay, who was the executive chef at Daniel Boulud’s Lumiere in the city’s Kitsilano neighbourhood and is a protégé of Gordon Ramsay, won the reality-TV series “Top Chef Canada” in the spring and has ridden the success of that accomplishment. 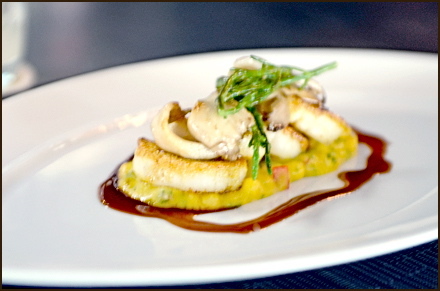 Some of the dishes, including a Black Cod ($18) with a Thai broth that “Top Chef” judge Mark McEwan called “liquid gold”, were featured prominently during the series while others were brought over from Lumiere, but offered at Ensemble at roughly half the price. Unlike the meal I had at L’Abattoir, where the flavours were sensationally distinct, Ensemble’s cuisine seemed reminiscent of favourite comfort foods. The wonderful Potato Gnocchi ($12) reminded me of bite-sized potato pancakes and the Herb Risotto with Shrimp ($16) had the warmth and texture of porridge. MacKay was visiting Toronto when I dined at Ensemble, so I relied on Cho to fill me in on the restaurant and its star chef. MacKay didn’t break down on camera, nor does his restaurant look like it will succumb to the “curse” that has befallen its predecessors at 850 Thurlow Street. Cornmeal-Crusted Scallops are one of Ensemble's top-notch dishes. A recent Friday and Saturday night was completely booked, although you can walk in and dine at the bar — if there’s room. 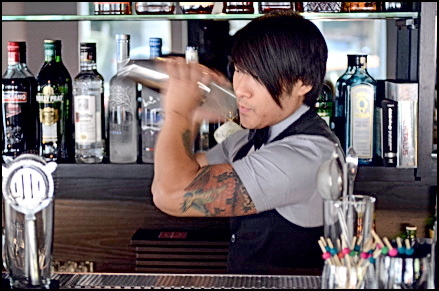 Or simply enjoy Cho’s wonderful concoctions, including a marvelously refreshing Ginger Gimlet ($8) and a flavourful Basil Caiphirina ($12) that’s made with Brazilian rum.